Parenting of the 링그. Looks like Dark Link was being naughty..... Wallpaper and background images in the Super Smash Bros. Brawl club tagged: super smash bros. brawl image screen gallery snapshot. This Super Smash Bros. Brawl fan art might contain 어깨 패드, 소매 없는 느슨한 상의, and 휘장. Wow this is so cool! I just favored it! Good work. lol its like their their kids. MAJOR MPREG MOMENT.............DON'T JUDGE ME. TOON LINK!YEAH!MY FAVORITE CHARACTER IN BRAWL! 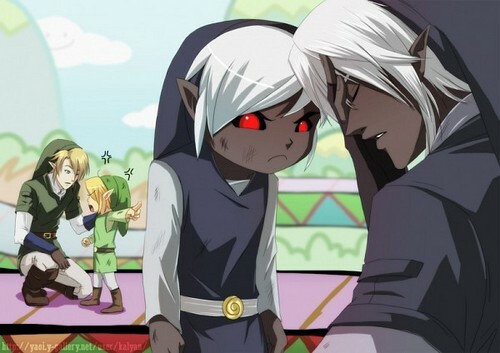 Toon Link:He beat me up,then I called him black.